Some months ago, one of our neighbors participated in a human slogan on Ocean Beach: Tax the 1%. 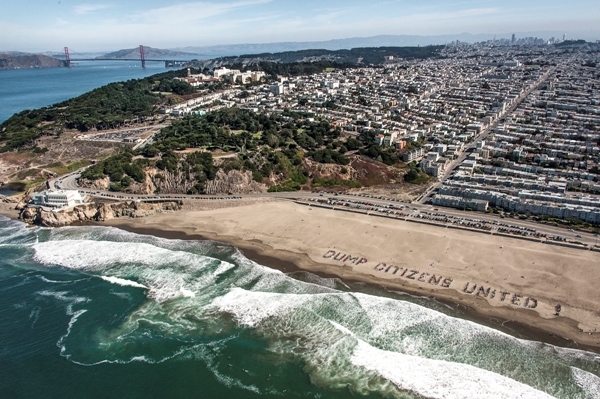 Recently, the same group “The Other 98%” organized over 1000 people into another slogan: Dump Citizens United. They hired a helicopter and photographer John Montgomery took some amazing shots of the event – and of San Francisco. For more of these brilliant pictures (in higher resolution), go to their website HERE. WHAT IS “CITIZENS UNITED” ? In 2010, the Supreme Court ruled in the case Citizens United v The Federal Election Commission that “it was unconstitutional to ban free speech through the limitation of independent communications by corporations, associations and unions, i.e. that corporations and labor unions may spend their own money to support or oppose political candidates through independent communications like television advertisements.” (Source: Wikipedia). “By defining corporations as people and money as speech, the Supreme Court has undermined ‘government of, by and for actual people,’” said John Sellers, co-founder of The Other 98%, the organization behind today’s event.